Kiasmos is the collaborative project of Icelandic composer Ólafur Arnalds and Janus Rasmussen, of synth pop outfit Bloodgroup. The duo's self-titled debut album, released earlier this month, sees the pair of musicians exploring the sonic space between their respective sounds; fusing the classically-informed string arrangements and experimental electronics of Arnalds' soundtrack work with Rasmussen's bold, melodic synth tones. Ahead of their show at London's Village Underground this Saturday (29 November), FM caught up with the pair to find find out how their respective musical ethos came together for the project. Janus: "I actually started playing guitar and making electronic music at the same time. Me and a friend got really into Aphex Twin, so we spent most our time trying to sound something like him. Great teacher." Ólafur: "I was sent to music school when i was a little kid and studied drums and piano. I started recording bands (mostly my own bands) in my parents garage with some equipment that my dad invested in for me to get me started. I had Logic, a two channel sound card and a little Behringer mixer." Janus: "I always have a pair of trusty studio monitors at home, just so I can check on mixes or do some editing when ever I'm in the mood. But most my work is done in my studio space, that's where all my equipment is. "It's always a mixture of hardware and software when I'm working. It's been a while since I stopped caring about what I use to make music. If it sounds great, then I use it. I do tend to use analogue synths a lot though." Ólafur: "Our studios are actually in the same big old warehouse turned studio complex. I have been there three years. My room in there used to be a THX Cinema mixing space so it's treated as such. I've been trying to bring the acoustics a bit more to life though by adding some wooden panels and diffusers but I love the dry sound as it gives me full control of everything I record in there. Surprisingly strings and piano sound really great. I am total analogue guy and I've got a big collection of vintage EQs, compressors and synths although I often turn to in-the-box stuff for convenience." Janus: "I started using Ableton in 2006. It's not perfect, but I feel like it's more like an instrument than a DAW that's trying to do everything. 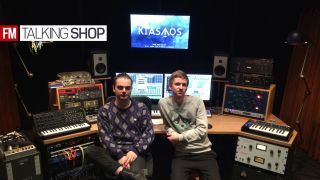 Most work with Kiasmos was recorded and produced in Pro Tools, which is a lovely program, it's perfect for mixing and editing." Ólafur: "My thinking is very engineer orientated, even when composing or arranging. So Pro-Tools has always been my DAW of choice." Janus: "Think it is the RE-201 Space Echo. We use it on everything. It's very heavily used on the Kiasmos album, I think we tried sending almost every track trough it at some point. "The grittiness and randomness of the tape is almost always a welcome addition to a stale sound. I don't even use it for echo most times. Send your pads to the tape without any repeat two times, pan them out and listen to that weird wobbly massive pad sound." Ólafur: "Yeah, I've used it so much for stereo effect that I got tired of always having to run everything through it twice… So now I've added two RE-555 and just keep them ready on a stereo send for whenever I need that!" Janus: "Just picked the new UAD-2 Satellite Octo with Thunderbolt, and added thunderbolt to my Apollo card. Couldn't be happier. "The Apollo interface is just so fantastic, it changed everything for my setup. The best thing about it is being able to monitor straight through it. Latency is finally a thing of the past!" Ólafur: "I just got a pair of LA2A compressors/limiters. Actually clones, put together by my lovely assistant Bergur. I was looking for a clean and present stereo compressor for piano, but I'm now using it for a lot of things i didn't expect to use it on! " Janus: "I'm trying to quit fantasising about gear. Actually selling some of it these days to try and start fresh. If I had to choose something, then I'd say some great studio monitors. Really excited about the Focal SM9." Ólafur: "Uh… A pair of Fairchild 660. A boy can dream, right?" Ólafur: "We usually start with a beat. Often with Elektron's Machine drum. And then we just hook up some synths and instruments and jam until we find something nice, a motif or a sound that we want to work with. A common situation in the studio is seeing Janus hovering over a synth with headphones on while I'm figuring out some chord progressions on the piano - all this with a beat going on loop in the background - for hours." Ólafur: "I'm working on the score for the 2nd season of the TV series Broadchurch and also finishing up a collaboration project with classical pianist Alice Sara Ott which we call The Chopin Project." Janus: "Just finished a score for a horror movie, and I'm now producing a disco album for the lovely Icelandic band Boogie Trouble. Talk about contrasts." "Roland's Space Echo has become a bit of a household item for many producers. Tape machines, however, have still not really caught up as much - perhaps because of their price tag. But what many people don't realise is that the space echo can serve as a wonderful, but unreliable, tape machines once you turn the intensity knob to zero (no repeats). A trick we use quite a lot is to run an element through the tape (no dry sound and no repeats) twice and pan them all the way left and right. Because of the tape's instability the two channels will be slightly different and create a wonderful stereo image! And as a bonus you get a lo-fi crunchy sound." "It's safe to say that we both learned this the hard way. If aiming to make a huge sound the first intuition is often to pile all the elements you could possibly think of into a huge wall. But in fact this often just creates a mess and you loose all dynamics. Organise big walls of sound smartly and don't let elements fight each other, give each element the space it needs to be both dynamic and melodic, or whatever it's purpose is." "…and we mean that literally. Listen closely to your mistakes, are they really mistakes? Many of the best ideas on our album came from these happy accidents. Especially technical glitches can be very inspiring. In fact think of how many common uses of equipment today are not their intended uses."